Eaton's boys cross country team placed fifth at the Neal Charske Firebird Invitational on Saturday, Sept. 29. 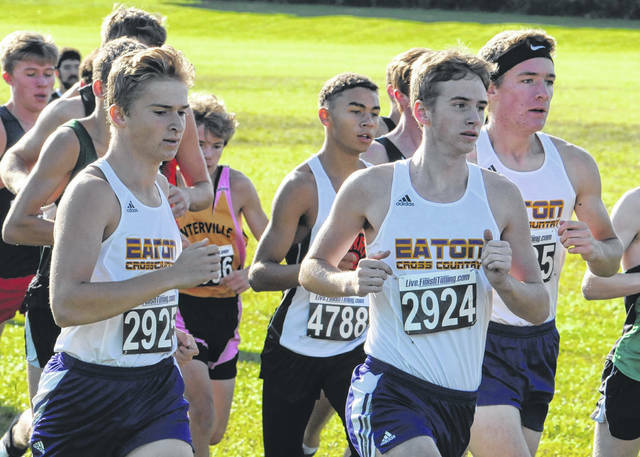 KETTERING — Eaton’s boys and girls cross country teams competed at the Neal Charske Firebird Invitational on Saturday, Sept. 29. The boys team placed 4th out of 21 teams in the Silver Varsity race. The team was sitting, statistically on paper, prior to the race, as the 8th best team in the D-I dominated race. Centerville, Kings and Defiance placed ahead of Eaton, all three are state ranked in the D-I boys state poll. The girls team placed 5th out of 18 teams in the Varsity Blue Race. The Blue race was a very competitive Division 2 dominated race. 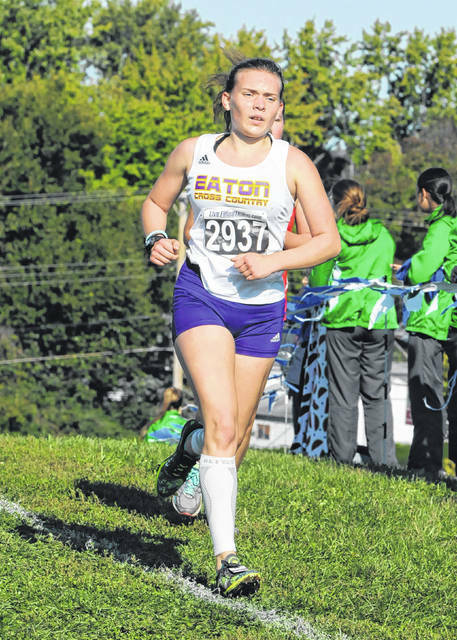 “We beat a few teams we haven’t beat so far this season and most of the girls ran a season personal best time,,” Eaton coach Randy McKinney said. Claire Meyer was 13th with a time of 21:28.5. Allison Mowen placed 17th in 21:51.5. Briana Baker was 31st in 22:34.0. Cari Metz finished 34th in 22:40.8. Ali Owens placed 52nd in 23:37.3. Rachel Buckler was 72nd in 24:03.5 and Nina Albinus finished 121st in 27:53.4. McKinney said he likes where his teams are currently. McKinney said the boys got their 1-5 team gap down to 49 seconds which is their best this season. “Our 1-7 gap was 1:25 our best this season. They are making the kind of progress I was hoping they gradually make during the course of the season, but they still have a lot time to continue to bring their times and team gaps down,” he said. McKinney said the girls team is also showing improvement. “The girls are working hard and bringing their times down as well. They too are making the progress I had hoped for to this point in the season. We are still a young team with a few veterans, so every time we step out on the course we learn a little more about our abilities and the sport in general,” he said. As the season heads into the home stretch McKinney is looking for a success end to the season. Eaton will host the Ed Leas Fall Classic on Saturday, Oct. 6. 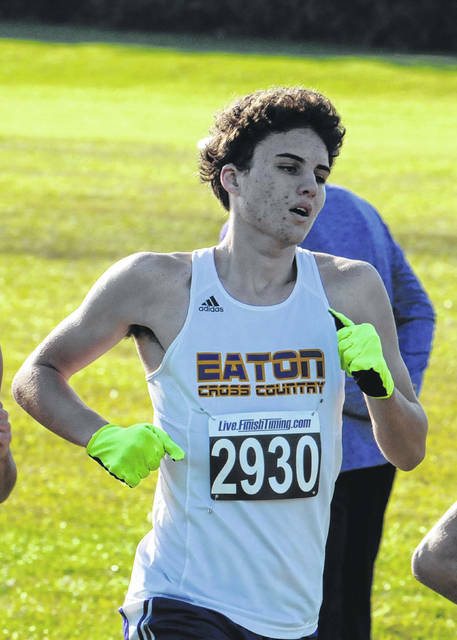 Eaton’s boys cross country team placed fifth at the Neal Charske Firebird Invitational on Saturday, Sept. 29.
https://www.registerherald.com/wp-content/uploads/sites/41/2018/10/web1_ehsxc2.jpgEaton’s boys cross country team placed fifth at the Neal Charske Firebird Invitational on Saturday, Sept. 29.